The Bürgerspital is a court in Salzburg′s Old Town that was once home to a hospital. It was named after its patron saint St. Blasius and currently home to two museums that are sub-branches of the Salzburg Museum: The Toy Museum (Spielzeugmuseum) and the Museum of Historic Musical Instruments. 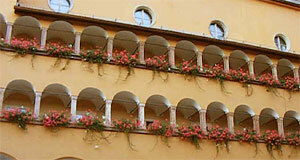 The Bürgerspital building is well-known in Salzburg for its central courtyard, which has several rows of arcades. Whilst this is not an unusual feature in large courts of Salzburg, the size and quality of this one is noteworthy. The Bürgerspital is build into the cliffs of Mount Mönchsberg right at the end of the Getreidegasse lane. The Gothic church St. Blasius is associated with it and right next to the court. However, the church was built before the hospital. The site of St. Blasius was originally occupied by fields that belonged to the Styrian monastery of Stift Admont. The monastery endowed the construction of the Gothic church in the 12th century. In 1327, Archbishop Friedrich III von Leibnitz exchanged some land for the fields around St. Blasius and used them for the construction of a new facility that should care for the sick and old. The current design of the church St. Blasius dates back to 1330, when the vaulted naves were built, utilising the previously existing church. In the same year, a cemetery was built next to the Bürgerspital. It existed until 1789. The name Bürgerspital means "burgher′s hospital" and refers to the fact that the bishop had funded only the construction of the facility; the maintenance was based on donations by the people (burghers) of Salzburg. With the foundation of the Vereinigte Versorgungsanstalten in the 19th century, the Bürgerspital was redundant. In 1896, a new, palace-like building for the Vereinigte Versorgungsanstalten was opened in Nonntal, near Schloss Leopoldskron. This facility united several charitable organisations of the city of Salzburg. It is still used as a home for the aged and clearly visible if you look from the fortress southwards.